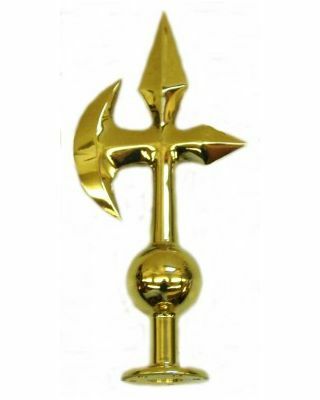 This brass Navy Halberd ornament measures 10 in. height by 4 in. width. This ornament also includes a 1 in. bottom ferrule/truck not shown in the image. The Navy's NTP-13(B) States; This flag pole ornament may be used for flag officers whose official gun salute is less than 19 guns, and for civil officials whose gun salute is 11 or more but less than 19 guns. Included in this category are such individuals as the Under and Assistant Secretaries of the Army, Navy, and Air Force; Naval or Military Governors; and flag officers of the Armed Forces other than those of 5-star rank or Service Chiefs.